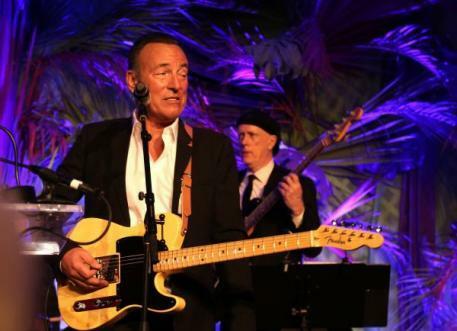 “Bruce Springsteen did something different with the once tried-and-true car-song genre. These weren’t your typical paeans to Detroit’s legendary chromeboats. No, dangerous things happen in Springsteen’s cars — things that, in the blink of an eye, can change a life forever. These weren’t your average tales of escape, either. No, that common trope was typically turned on its ear by what Springsteen’s characters — dark protagonists, average guys with extraordinary burdens, doomed lovers — would find at the end of that long journey. Bruce Springsteen’s new biography is revealing, honest, and personal. Its also superbly written. Born to Run is authentic and genuine. It provides readers with a transparent window into Bruce’s lifelong struggle and his personal and professional success. The book is a powerful, profound, and detailed account of an unusual and prolific life. 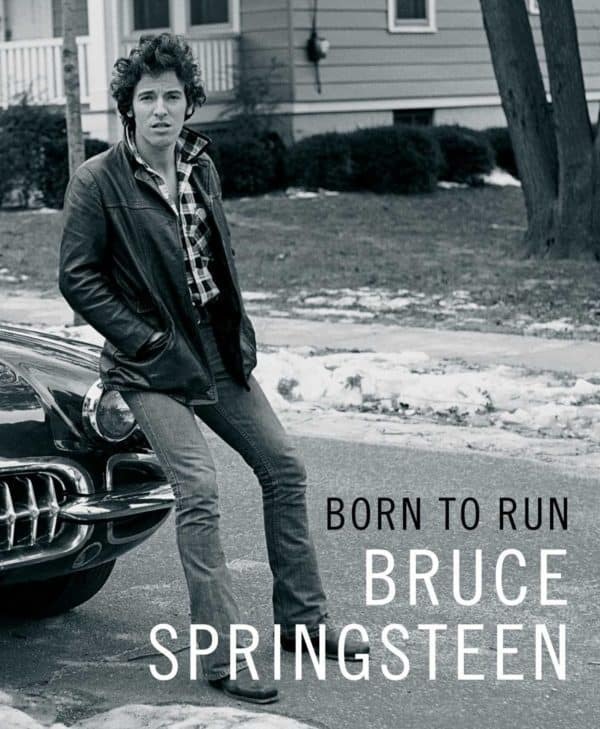 As an autobiography, Born to Run succeeds because of its honesty and humility. Bruce masterfully lets the reader into his life by giving uncensored access into his mind, feelings, and opinions. The result is a page-turning biography of unique flair and substance. The book is a timeless smash success—a status few autobiographies ever achieve. Bruce is a passionate car and motorcycle guy—even to this day. Just last week Bruce’s Italian Moto-Guzzi (modified by Bill Joel’s shop 20th Century Cycles) broke down near his hometown in Freehold, New Jersey. The roadside rescue by a local Harley Club member made national news on CNN. 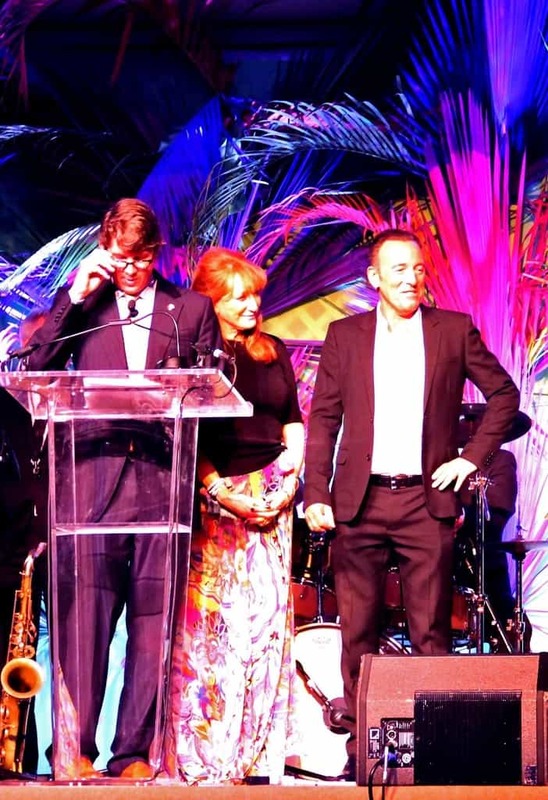 Over the last several years, Bruce and his wife Patti Scialfa have become regulars on the “A” equestrian show jumping circuit. Their daughter Jessica has enjoyed a meteoric rise in the sport. I predict that she is on track to represent America at the Tokyo Olympic Games in 2020. 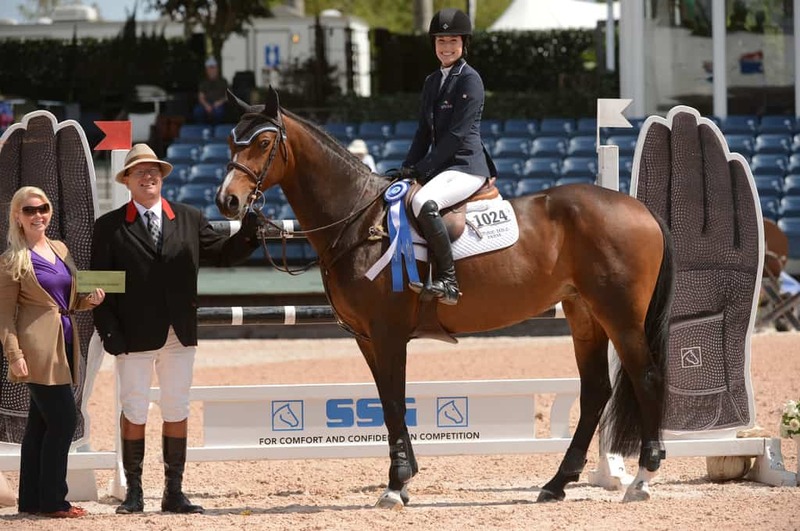 Jessica is a naturally gifted rider who is highly competitive and devoted to her horses. Like her father, she works hard! I used to compete against her in the high amateur jumper division. However, she quickly moved into the international Grand Prix level—leaving me in the dust. For me, it has been fun seeing the Springsteen family out enjoying the horse show circuit. 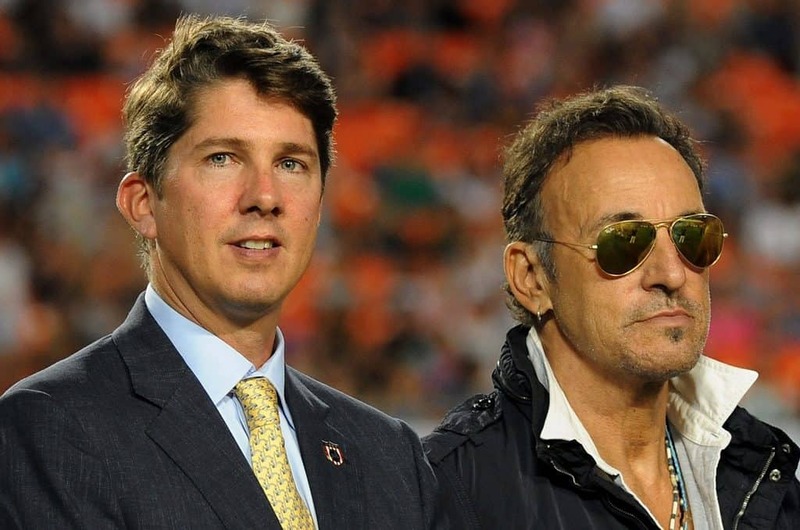 The Springsteen’s maintain a low profile but are always friendly and have been very generous supporters of the United States Equestrian Team (USET). 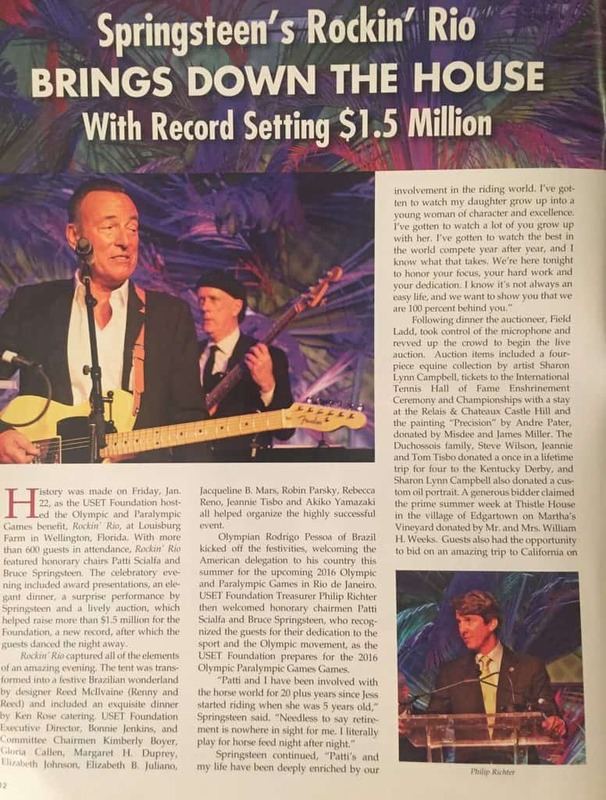 I am the Treasurer of the USET, and earlier this year I was the Master of Ceremonies for our Rockin’ Rio Olympic Fundraiser. Bruce and Patti were Co-Chairs of the event, and we ran the silent auction together. For many years now, Bruce and Patti have been instrumental in helping the Team achieve its goals. It was an honor share the stage with these two rock stars. Because of their enthusiasm and support, we had a great evening and shattered USET fundraising records. Bruce surprised the audience and ended the night with his rendition of the hit song “Money “(That’s What I Want). Go out and pick up a copy of Born to Run—it’s a must read. The Amazon Kindle version can be downloaded here. It will make a relaxing offset for the often tense and stressful Holiday Season. Born to Run is also a perfect gift idea. I’ve already ordered several copies for my family and friends. 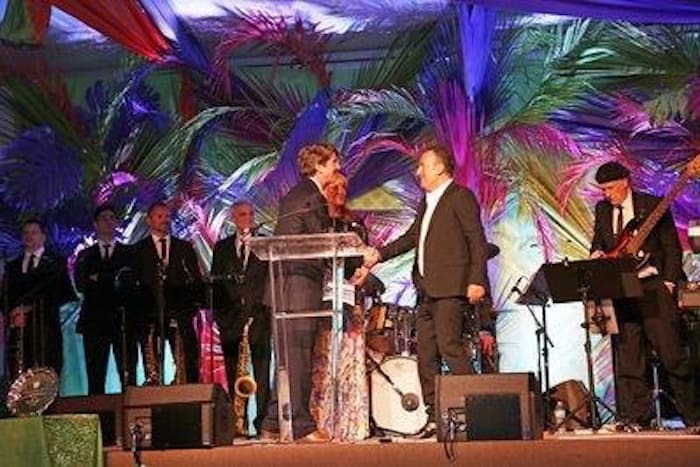 With Bruce on stage at the USET Rockin’ Rio Gala Wellington Florida 2016. I was the Master of Ceremonies and Bruce and Patti were Co-Charis of the event. I loved the book! found it motivating and real. I did not know about his daughter…good for her, and for the family. Jessica is a super star rider. 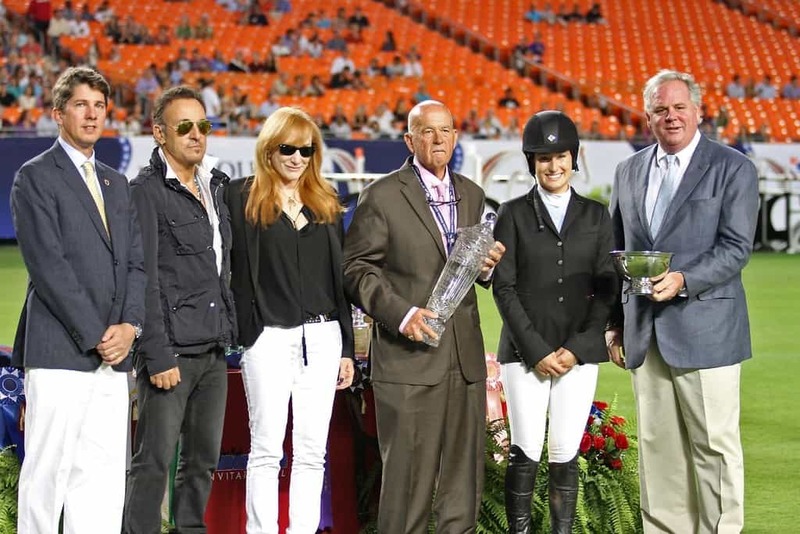 Bruce and Patti have been great supporters of the sport of show jumping. Jessica is well on her way to being one of the great young riders of the era! Bruce’s book is so good, its one of the greatest autobiographies I’ve ever read and its even better if you are a car guy!